Everything you need to start comes in this box. 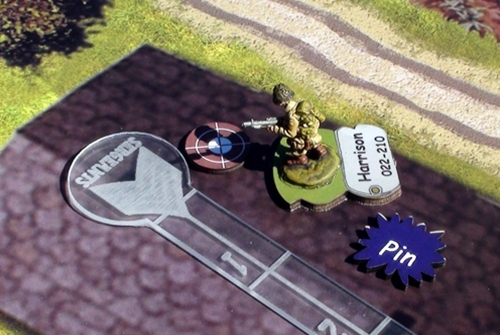 Sergeants Miniatures Game (SMG) offers a unique gaming experience. You might call it a "card-driven miniatures game." You might call it a "3-D boardgame." What you’re sure to call it is, challenging, quick, and fun to play. 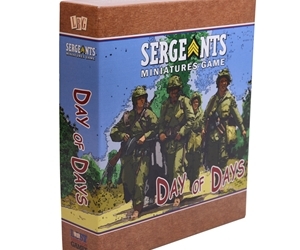 Sergeants Miniatures Game is a totally new system, with the game’s engine run by impulse cards managing four broad, basic functions—and randomizing the order—while each player manages a hand of cards constructed by the talents and foibles of the troops under his or her command. Unlike many "miniatures" games where you buy the rules and then have to start shopping and painting, SMG is a complete game out of the box. 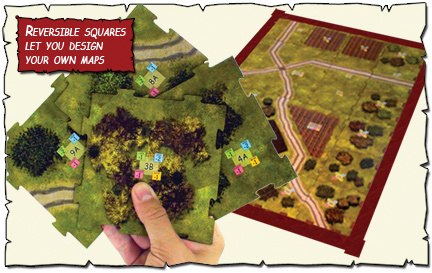 You’ll find 20mm, pre-painted miniatures, plenty of thick, two-sided, colorful mapboard tiles which can assembled in various ways, easy rules, scenarios, player aids... everything else you need to get started on your missions and having fun fast. 10 pre-painted figures, for Sergeants, Privates, and "Characters"
18 tiles for terrain and landmarks, which can make a mapboard 20" by 30" large, or be put together in smaller configurations. Rulebook, plastic movement/sighting player aids, and everything you need to get started! Day of Days is a "Story," which includes everything you need for a 2-player game. Additional figures can be added to make this a 3 or 4 player game.